Dartmouth's smart fabric sensing technology offers support for performance coaching and physical therapy. Credit: Figures provided by Dartmouth DartNets Lab. A computer science research team at Dartmouth College has produced a smart fabric that can help athletes and physical therapy patients correct arm angles to optimize performance, reduce injury and accelerate recovery. The proposed fabric-sensing system is a flexible, motion-capture textile that monitors joint rotation. The wearable is lightweight, low-cost, washable and comfortable, making it ideal for participants of all levels of sport or patients recuperating from injuries. The study, published in Proceedings of the ACM on Interactive, Mobile, Wearable and Ubiquitous Technologies, will be presented later this year at the UbiComp 2019 conference in London in September. "We wear fabrics all the time, so they provide the perfect medium for continuous sensing," said Xia Zhou, an associate professor of computer science at Dartmouth. "This study demonstrates the high level of performance and precision that can be acquired through basic, off-the-shelf fabrics." Accurate monitoring of joint movement is critical for performance coaching and physical therapy. For athletes where arm angle is important—anyone from baseball pitchers to tennis players— long-term sensing can help instructors analyze motion and provide coaching corrections. For injured athletes, or other physical therapy patients, such monitoring can help doctors assess the effectiveness of medical and physical treatments. In order to be effective to a wide-range of wearers, monitors need to be portable, comfortable, and capable of sensing subtle motion to achieve a high-level of precision. "Without a smart sensor, long-term monitoring would be impractical in a coaching or therapy," said Qijia Shao, a Ph.D. student at Dartmouth who worked on the study. "This technology eliminates the need for around-the-clock professional observation." While body joint monitoring technologies already exist, they can require heavy instrumentation of the environment or rigid sensors. Other e-textile monitors require embedded electronics, some only achieve low resolution results. The Dartmouth team focused on raising sensing capability and reliability, while using low-cost, off-the-shelf fabrics without extra electrical sensors. The minimalist approach focused on fabrics in the $50 range. 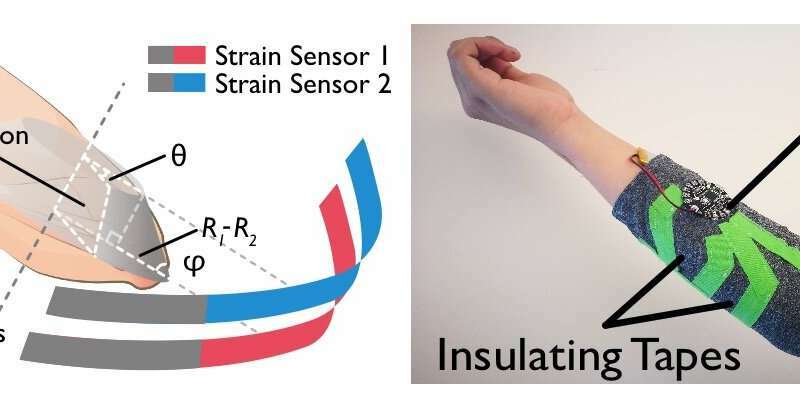 "For less than the price of some sweatshirts, doctors and coaches can have access to a smart-fabric sensing system that could help them improve athletic performance or quality of life," said Shao. To design the wearable monitor, the team used a fabric made with nylon, elastic fiber and yarns plated with a thin silver layer for conductivity. Prototypes were tailored in two sizes and fitted with a micro-controller that can be easily detached to receive data on fabric resistance. The micro-controller can be further miniaturized in the future to fit inside a button. The system relies on the stretchable fabrics to sense skin deformation and pressure fabrics to sense the pressure during joint motion. Based on this information, it determines the joint rotational angle through changes in resistance. When a joint is wrapped with the conductive fabric it can sense joint motion. In a test with ten participants, the prototype achieved a very low median error of 9.69º in reconstructing elbow joint angles. This level of precision would be useful for rehabilitation applications that limit the range for patient's joint movement. The fabric also received high marks from testers for comfort, flexibility of motion and ease of use. Experiments also showed the fabric to be fully washable with only a small amount of deterioration in effectiveness. "Testers even saw this for use in activities with high ranges of movement, like yoga or gymnastics. All participants said they'd be willing to purchase such a system for the relatively inexpensive price tag," said Zhou, who co-directs Dartmouth's DartNets Lab. While the prototype was only tailored for the elbow joint, it demonstrates the potential for monitoring the knee, shoulder and other important joints in athletes and physical therapy patients. Future models will also be cut for a better fit to reduce fabric wrinkling which can impact sensing performance. The team will also measure for the impact of sweat on the sensing performance. Your feedback will go directly to Tech Xplore editors. Your email address is used only to let the recipient know who sent the email. Neither your address nor the recipient's address will be used for any other purpose. The information you enter will appear in your e-mail message and is not retained by Tech Xplore in any form.